Born in Vancouver, BC and raised on the West Coast, Kirstie Lauren is passionate about making the world a shade greener. 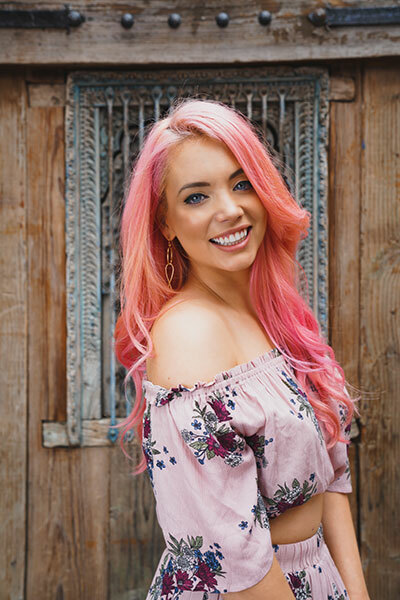 With her commitment to organic, natural and non-toxic products and through the popular Instagram account, @TheGoofyMermaid, Kirstie has become highly regarded in the world of green beauty. With the relationships she’s built, Kirstie has collaborated with top brands and her loyal ‘green’ following has allowed her to step into the role of entrepreneur with the launch of her very own green beauty discover box, Beauty Gone Green. Kirstie attributes her success to her genuine desire for knowledge and the ability to share her research in a way that her followers can easily understand. She believes going green’ isn’t about perfection, rather an elevation – an elevation in knowledge, awareness, and consciousness. She believes that if you love and nurture your body then it will love and nurture you in return. Because it’s not about making perfect choices, just better ones. Hi Kirstie, please tell us a little about you? I’ve always had a passion for business, wellness and beauty and was motivated to start Beauty Gone Green because I wanted to be my own happiness dealer and make a difference in the world. Growing up I heard the saying ‘follow your dreams’ or ‘find what makes you happy’ and I was lucky enough to find my passion and turn it into a business that I believe is truly making the world a better place. My Mom. She’s always there for me and is the one who led me down the path of healthy choices. She was very mindful of what I ate as a child and junk food was definitely not an option. She has been reading labels and purchasing organic foods for as far back as I can remember. Now as an adult I reflect back and really appreciate the extra time she took to make sure her family was eating healthy. How did you get started with The Goofy Mermaid? The Goofy Mermaid was started to help educate and share research on manufacturing processes. The goal was to bring attention to harmful ingredients that major beauty brands regularly use in their products and help people become more aware of what they are putting on their skin. From there it grew into a “green” community and is now a trusted place where people regularly go to when they are looking for new non-toxic beauty brands + products. Who is your biggest green beauty inspiration? I’m currently very inspired by Miranda Kerr and Olivia Wilde. I love how they’re using their platforms to give the green beauty movement a voice. Women spend a lot of money on beauty and there is power in the purse, so it makes me extremely happy to see high profile women striving to make a difference and working to create change. Tell us about your new subscription box “Beauty Gone Green”? Beauty Gone Green is designed to be a fun and affordable way for people to make healthier choices about their beauty routine. Every other month I curate the box with all of my favorite brands and offer them at a huge savings. Each box is worth over $200 and priced at only $69, which gives people a chance to try new and award winning brands at a fraction of the price. I also choose a beautiful reusable box design, which helps us leave less of a footprint on the world. Where we can look for more details about it? thegoofymermaid.com under the ‘Beauty Gone Green’ tab. Hard work, determination and lots of energy! It’s also super important to surround yourself with a positive and supportive network. I LOVE smoothies! I change it up daily, from green smoothies packed full of kale, spinach, vegan protein powder, to carrot, ginger, turmeric, pineapple and marine collagen smoothies. 100% without a doubt it’s Popcorn…especially with coconut oil, salt and pepper! YUM! Name one green beauty product you can’t live without? Bella Aura’s Instant lifting Eye Contour & Poetique’s Radiance Boosting Serum. I will be running my business and working hard to educate people about the importance of making more mindful and healthier choices about what they put on, as well as in, their bodies. I’m an animal lover, so I jump at the opportunity to support charities like Best Friends Animal Society. I recently teamed up to support their #SaveThemAll campaign which aims to bring the U.S. to a no-kill country by 2025. I’ll also be traveling to Thailand to help support and raise awareness for the Elephant Nature Park. Sun screen, sun glasses and my cell phone. Sleeping in, yoga, brunch and spending time with my fiancé and 2 dogs Sarge and Honey. Travel destination: I love to travel and explore! My next trip is planned for Thailand and hopefully after that I can make it to Iceland. Celebrity Crush: Chris Hemsworth and Adrian Grenier. Book: The Year of Less by Cait Flanders. Movie: Love Actually & Center Stage. I’m at @thegoofymermaid on Instagram, Facebook, Twitter and Snapchat.